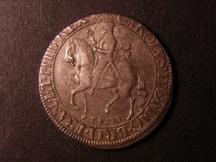 1585 Halfgroat Edward III Pre-treaty Series E York mint variety with Lis on breast (Doubleday 449, LAL 12, N.1166, S.1582) GF or better with a little edge loss. Rare. The Doubleday specimen is catalogued as 'a very rare variety'. 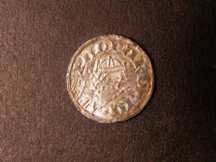 However, with the onset of metal detecting more specimens have come to light. 1863 Groat Henry VIII posthumous base silver, York mint, no mint mark. S.2409. Bust very fine, reverse only fine, striking split at top. 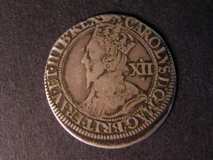 1862 Groat Henry VIII posthumous base silver, York mint, bust 4, no mint mark. S.2409. Good fine/fine. 1819 Edward I Pennies (5) York mint, classes 3c, 3e, 9b. Good fine to very fine. 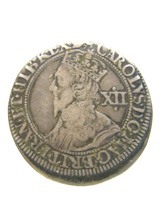 1801 Charles I Shillings (4) mint mark tun, crown, star and lion (York). All about fine, last one is pierced. 1877 Hammered (3). 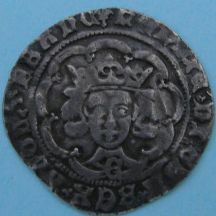 Edward III Half-groat, pre treaty London, class c, Richard II Penny York mint, Henry V Halfpenny. Fine to good fine. 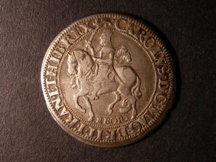 1866 Half Groat Henry VIII 2nd coinage, York mint, Archbishop Lee, EL beside shield, mint mark key. S.2348. Good fine/about very fine.